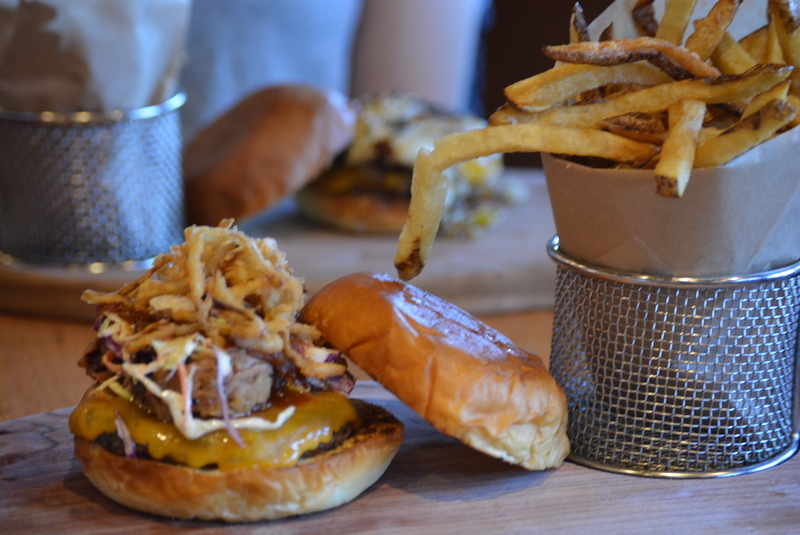 Bang Bang Burgers in Elizabeth is the brainchild of Joseph Huang, a graduate of the Culinary Institute of America. 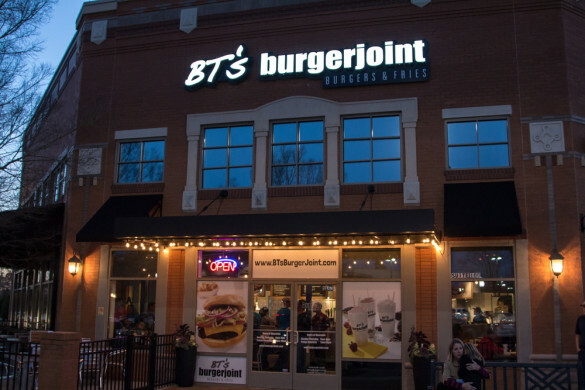 It opened in 2013 as a new take on the fast/casual Charlotte burger scene. In 2014, Joseph Huang spoke at length to the Charlotte Burger Blog about his culinary philosophy and why he chooses to carry the New York favorite, Pat LaFrieda beef. 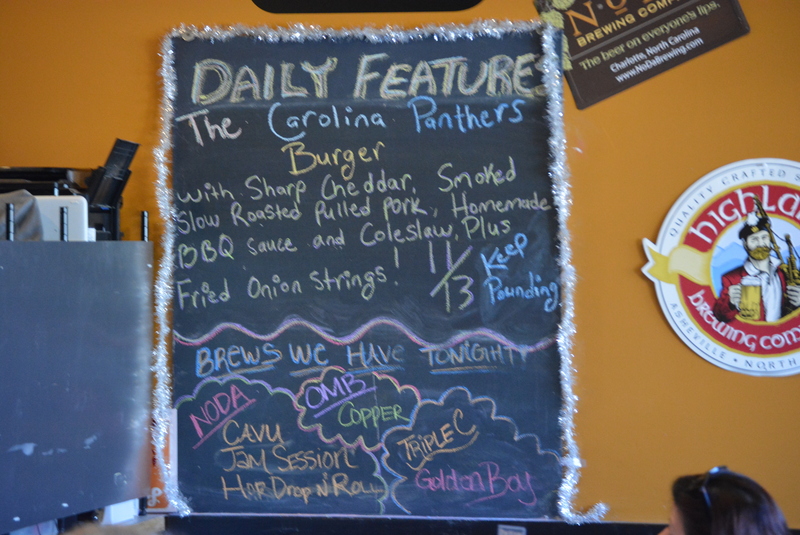 In this review, Hereford shakes off the rust of not having written a review in a year and tries a burger designed to celebrate the NFC Champion Carolina Panthers. Uh, where have you guys been? 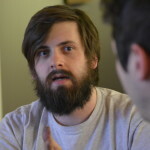 I honestly wasn’t sure that I wanted to continue this blog by myself, as it was such an extension of our friendship. We’ve found a way for that not to be an issue, though. Like most other burger things these days, we’re franchising. 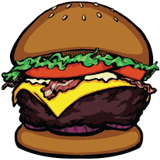 You can now check out Angus’s signature burger-takes over at Triangle Burger Blog, while I’m diving back into the Charlotte burger scene. 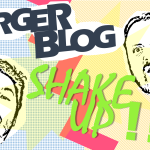 For my first review after our relaunch, I decided to visit one of my favorite places that we had not yet written about—Bang Bang Burgers. We had sat down and interviewed the owner of Bang Bang a couple of years ago for an interesting interview (which can be found here), and since then I’ve absolutely been a fan of this place. It seemed like a good place to start. The week before the Super Bowl 3 I pulled all of my burger recording tools out of a dusty chest which was collecting spider eggs in my attic and got back into action. How has Bang Bang fared since the last time you guys went? Fantastically, it seems. 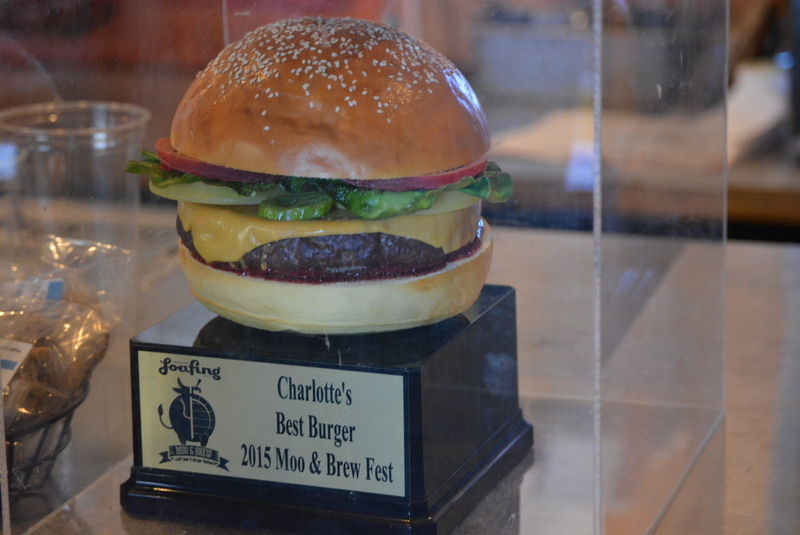 In fact, they won the award for “Charlotte’s Best Burger” at the 2015 Moo & Brew Fest against some stiff competition. The Moo & Brew Fest is an exciting event, and incidentally the second annual one is coming up this April. 5 No word yet if they’re giving out trophies again this year, but Bang Bang has theirs proudly displayed at the counter in a tiny version of Lenin’s Tomb. What is the atmosphere at Bang Bang like? It’s exceptionally busy. Bang Bang is at the Pecan Point shopping center in Elizabeth, and I went there on a Saturday afternoon. When I parked, it was literally the last parking space in the lot. 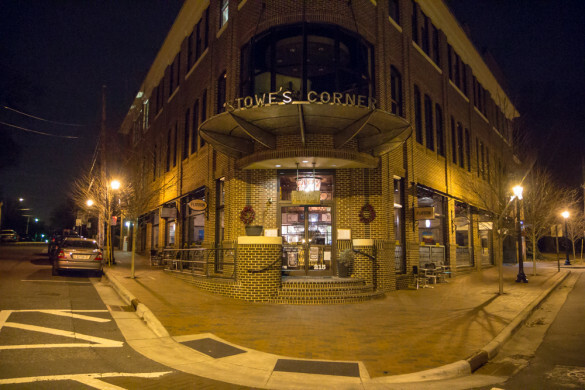 It occurred to me that maybe it was busy because people were parking there and walking to some of the other local establishments (parking in this area and in Plaza-Midwood is becoming hellish), but when I went inside I discovered that wasn’t the case. When we got a table, I’m pretty sure it was the last one too. 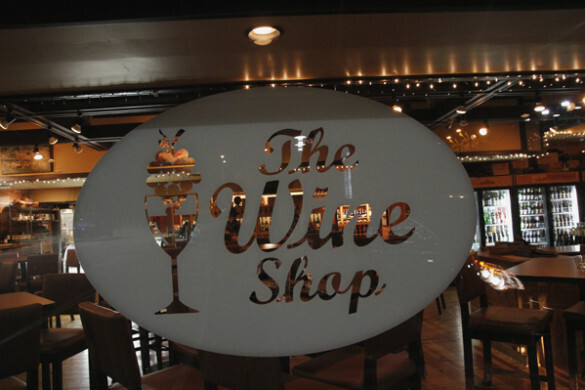 This is quite a family friendly restaurant. Not only do they have a kids’ menu, but it’s actually cheaper for kids to order from it than for adults. 6 Kids also eat free on Tuesday, and they even had cartoons on their TV—and not the good cartoons either, the kind only kids would like 7. One of my all-time favorites, Olde Meck Copper. Bang Bang doesn’t have an extensive beer menu, but they do focus on local options, which we always appreciate. What burger did you get? First, I’d like to note that I didn’t get the cheeseburger eggrolls. Why not? Because I’m a freaking idiot. They’re ridiculously delicious and I sort of panicked when I got to the counter. (Again, I’m rusty at this.) And, because this is fast/casual, I couldn’t just ask my server to add it to my order when he or she came back around. I would have to wait in line again and I didn’t want to do that. Damn you, fast/casual! and a TNT burger with jalapeño salsa and tempura onion rings. 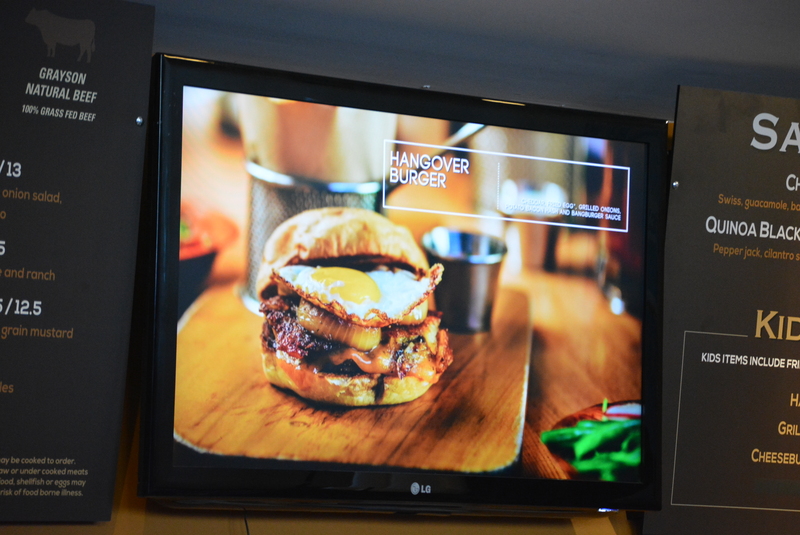 As you can see, they also do a fantastic job of making their burgers look drop-dead gorgeous in their slideshow menu. Any of those would have been fine options, but I didn’t even consider them. As I said, this was the week before the Super Bowl and everyone (including this guy) was excited about the Panther’s NFC Championship win. Bang Bang was celebrating the impending Super Bowl with a Carolina Panthers Burger, celebrating the team and the Carolina region. That’s what I picked. On a related note, how depressing was the Panthers’ defeat? My god, it was awful. The offense seemed completely impotent and the game seemed at any minute like it could get out of hand. At the same time, it seemed at any moment like they could get back into it because the defense kept the game close. It was demoralizing and frustrating. I sincerely apologize for making you relive that. Official Weight: I don’t know, my scale screwed up and I didn’t notice until after I had started eating. I feel like such an amateur. 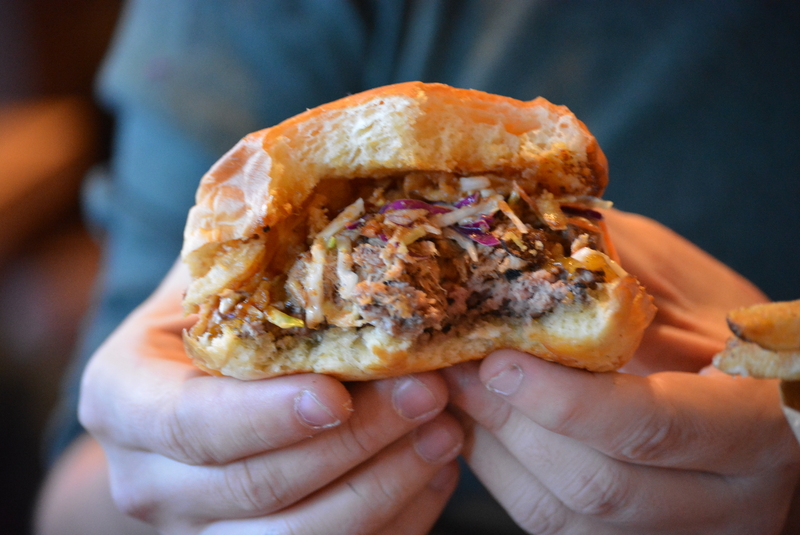 The best part of Bang Bang Burgers is their meat. They are very proud to serve Pat LaFrieda meat. Pat LaFrieda beef comes from New Jersey, and Bang Bang’s owner, Joe Huang, told us he uses it because he feels it’s better quality than anything you would find around here. I can’t say for sure if that’s the case, but I can say it’s high quality. They put a lot of interesting toppings on their burgers, but I feel confident saying that if you got a plain burger you wouldn’t be disappointed. That said, I really liked the topping mix on this burger. It felt like it had a little bit of everything—it had sweetness from the bbq sauce, smokiness from the barbecue itself, sharpness from the cheddar, and tanginess from the slaw. The slaw and onion rings had a contrasting wet/dry crunch. Every bite had a different taste sensation. I really enjoyed how it all worked together. 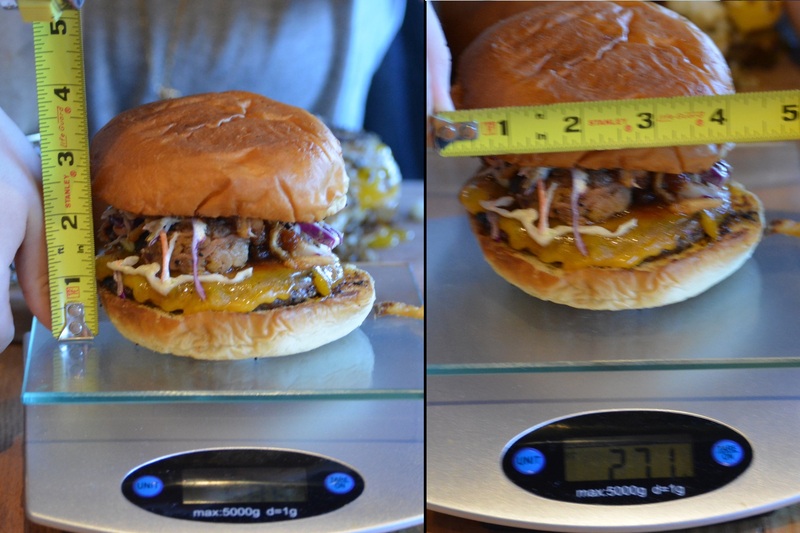 Unfortunately, I ordered my burger medium, and I got medium-well. There was no pink in the middle, which is an incredible disappointment. A burger establishment of Bang Bang’s quality should get the temperature right. 10 Luckily, the burger was still incredibly juicy and flavorful. I can honestly say that it didn’t much impact my enjoyment of the burger. It says a lot about using well-seasoned, high quality meat. As a BBQ snob, what did you think about having western-NC style BBQ sauce? I have thought a lot about this. I’ll do my best to keep this brief. Ostensibly, this isn’t just a burger featuring ingredients that taste good together, though they undeniably do. Based on the name, they should represent not just Charlotte, but Carolina (presumably North & South) in regards to their barbecue. My first instinct is that they should have used an Eastern-NC vinegar sauce. That’s always my first instinct, having grown up there. Although I don’t think Eastern NC embraces the Panthers like other areas of NC does, I would say most traditional barbecue places in Charlotte serve Eastern-NC sauce. So, merely as a matter of representation, I would suggest a vinegar sauce, though maybe I’m biased. 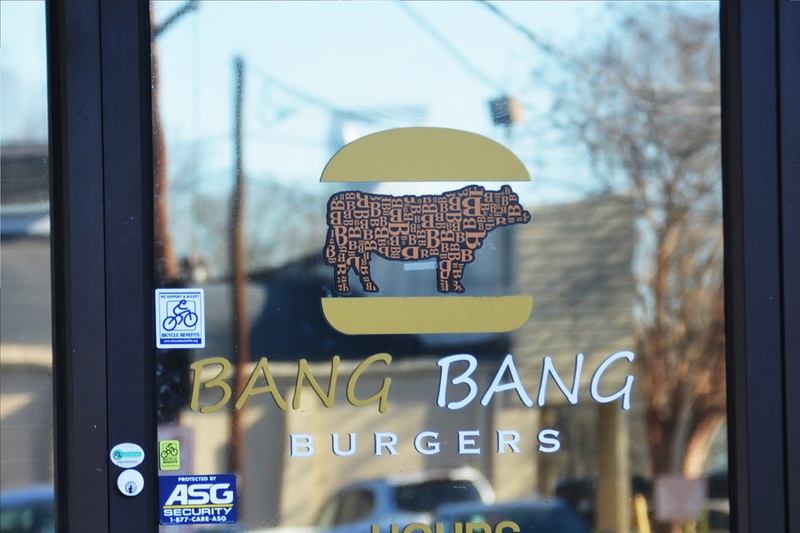 Does Bang Bang earn the Charlotte Burger Blog Seal of Approval? Yes! The quality of the meat alone earns it, but they also do a great job creating interesting flavor combinations. I heartily recommend it.